When one Luxarazzi speaks to another could be the title of today's Castleholics Anonymous. In our new edition, I spoke to one of my favourite people in the world and co-blogger at Luxarazzi, Nichole, about her favourite castle experiences in Europe, American castles and royal sights around the world she would like to visit (and I want to squeeze in her suitcase to come along). After reading, also make sure to check our giveaway to celebrate three years of Castleholic! You lived in Europe for a while - do you have a favourite castle or palace here? The favourite castle that I visited was the small Schloss in Bad Homburg vor der Höhe near Frankfurt. It isn’t a large or particularly sumptuous Schloss but it is my favourite. Because I lived in Frankfurt am Main, I often traveled there to visit it. I also had a truly wonderful time during all of my visits and that really gave me an emotional connect to it. I was also very impressed by Schloss Schönbrunn in Vienna. It was exactly what I expected from an Imperial residence in all the best ways. However, I found the tour thoroughly unenjoyable. I toured the palace in July and it was miserable! The palace, as one would expect, does not have air conditioning. There was very little air moving inside the palace and it was literally packed wall-to-wall with tourists adding to the heat and misery. If you really wish to enjoy the Imperial residences in Vienna then please don’t visit during the middle of summer when it is very hot. The favourite place that I didn’t get to visit would probably be Schloss St. Emmeram in Regensburg. The home of the Princely Family of Thurn and Taxis looks really impressive in photographs and video tours. The grand stair case and the state bedrooms look beyond compare. They also have some ornate kachelofen. I have a not so tiny obsession with the beautiful kachelofen that are fixtures in most castles and palaces. The prettiest palaces though don't always make for the best visits. Can you tell us which your best experience visiting a castle or palace was? My best experiences were always at Bad Homburg’s small Landgrave’s Schloss. During my first visit there my friend (also an American) and I arrived at a time when only German tours were available. Upon discovering that our German wasn’t good enough to enjoy the tour, the guide and the other guests agreed that the tour should be in English. The guide and the other guests agreed amongst themselves to help make sure that everything translated into English for us if the guide’s English failed her. We were both new to Germany and were impressed by the kind and generous nature of the guide and our fellow guests. We would have completed the tour even if we could only understand what we saw with our eyes, but it was a wonderful experience to tour the castle in English and to experience the welcoming nature of Germans. We had to wear booties over our shoes during the tour to protect the floor. During the tour all of us were sliding around like children. Although the bootie system is usually no longer in use at historic sites (regular walking is apparently less damaging than sliding around in felt booties) it was really fun to scoot around in them. We also discovered that at this one little Schloss it was acceptable to touch the tables and sit on the sofas and chairs. I don’t know why this was exciting but it was! Europeans tend to think that we are the only ones who have castles and that the U.S. certainly doesn't have any. But that's not true, for example we covered Hearst Castle in California on here in the past. What is your favourite American castle? The United States has dozens and dozens of enormous homes with palatial interiors and grand gardens. Many of them are named castles and are just as lavish as many grand old pile in Europe. Being an East Coast girl I am partial to Biltmore Estate, The Breakers, Lyndhurst and Ochre Point. There are other grand estates both old and new but these are my favourites. My absolute favorite is and will always be Biltmore Estate. It is the largest private home in the United States and is owned by George Amherst-Vanderbilt-Cecil. The Vanderbilt name is known to all Americans for their grand wealth, grand homes, lavish lifestyles and good marriages. 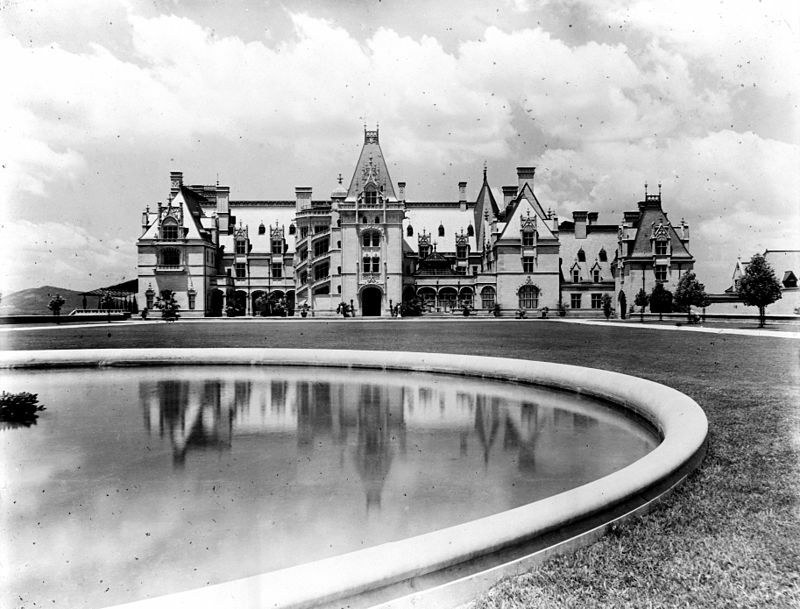 The current owner, George, obtained his triple barrel surname because he is the son of Cornelia Vanderbilt and The Honorable John Amherst-Cecil who was a son of Lord William Cecil (3rd son of the 3rd Marquess of Exeter) and the peeress Mary Tyssen-Amherst, 2nd Baroness Amherst of Hackney. John had his courtesy title through is mother who was a peeress in her own right. The house has everything you would expect. It has elaborate exteriors, extensive gardens and park lands, luxurious furnishings, antiques and gadgets that would have been the most advanced available at the time. I have a particular fondness for the beautiful library and the indoor pool. A big ballroom, a major staircase, extensive gardens - what would the castle of your dreams look like? For me, a beautiful well stocked library would be an important part of my dream castle. I also enjoy walking in gardens, so an extensive and well planned garden would be important. I love flowers but I also find topiary gardens fascinating. I’d like to have both. I like the ornate woodcarving at Peles Castle in Romania. I would have some of that artistic carving in my dream castle. Of course, no castle of mine would be complete without lots of orante kachelofen! And as the last question: Leaving out all time and money restrictions, which castles and palaces are on your bucket list and why? My bucket list of castles and palaces are a mix of simple beauty and historical importance. ‘Ioloni Palace in Hawaii because it is an important part of American history. It is the only royal palace in the United States. 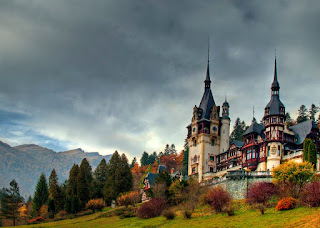 Peles Castle in Romania because it is fabulously ornate and the location in the Carpathian Mountains looks stunning. I would spend months touring India to take in all of the palaces there. I love the rich colors. I would tour everything in Mysore and the rest of the City of Palaces as my starting point. Topkapi in Istanbul because of the history. I would spend a year touring the grand palaces and estates of Russia and the states of the former USSR. The Hermitage and Catherine’s Palace in St. Petersburg would be key points. Russia has so many fabulous palaces that aside from the two mentioned I couldn’t even begin to make a top 10 list of them. Potala Palace in Tibet and the Forbidden City in China would wrap up my tour. I’m not specifically Eurocentric in my love of a good palace or castle. I appreciate that different cultures have equally impressive structures with intriguing history attached to them.